Charity – $3,000 was awarded to our 2018 Charity, Emergency Shelter Partnership, a not-for-profit organization that provides short-term emergency shelter and food for those in need of a safe and warm haven during the coldest five months of winter. This donation was made possible thanks to all who purchased raffle tickets and to sponsoring member Linda Stern. 2020 Charity Quilt – Thanks to all who brought blue and yellow fabrics for Pat Julian, our Raffle Quilt Coordinator for the 2020 show quilt. Comfort Quilts – Thanks to all who took a Comfort Quilt Kit to work on during the summer, your efforts are appreciated. All are invited to join the Comfort Quilters every Wednesday in their Summer Quarters at Bnai Israel in Armonk. Thanks to all the members who brought delicious dishes to share in June! Remember to send in your Registration Form. Those who sign up before September 1st will be eligible to win a $25 Gift Certificate, good for all Guild programs. Have fun with your summer reading! Check out next year’s tentative lineup of programs – Programs-At-A-Glance! Be working on those quilts for next year’s show – our 40th anniversary! Spend some time looking at quilts from past shows – click here. 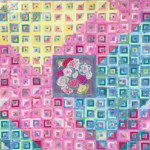 Section available to members (one notice per year) for posting personal quilt related offerings. Contact news@northernstarquilters.com with any newsletter updates.